Mix the mascarpone, cream, icing sugar, and vanilla pod seeds together. Separate the cream into 2 large bowls and smooth the top with a spatula. 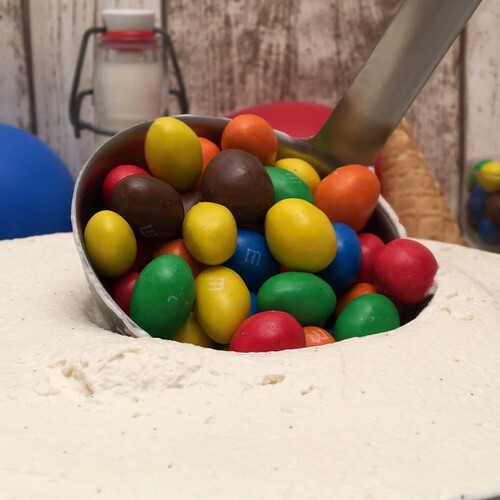 Using a ladle, form a hole in the middle of each bowl and fill one with the M&M’s. Arrange the bowl without M&M’s in on top of the other one to make a sphere. Place the bowls together in the freezer for 3 hours. Crush the rest of the M&M’s into small pieces using a rolling pin. Unmould the cream ball and roll it in the crushed M&M’s. Fill the ice-cream cone with the melted dark chocolate and stick it on top of the ball.